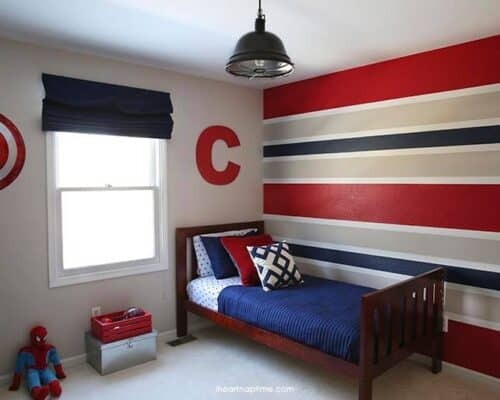 Hello Nap Time readers! 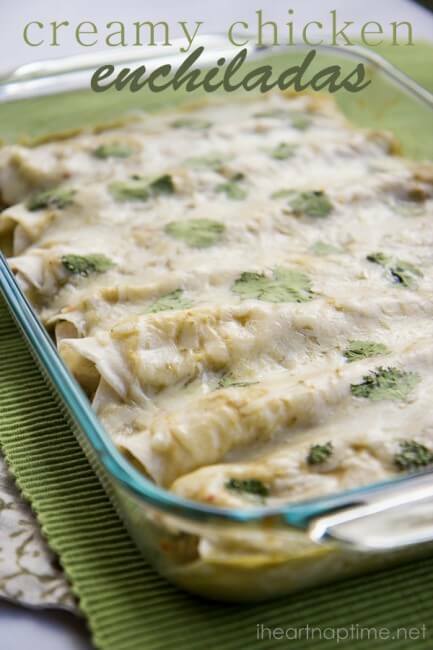 I’m thrilled to be back here with another quick and easy recipe! With Cinco de Mayo coming up, I seem to be thinking more and more about fun Mexican food ideas. 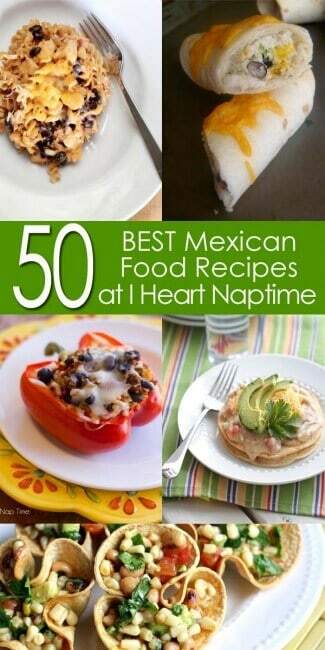 Ok, to be fair, I’m pretty much ALWAYS thinking about Mexican food – it’s my all time favorite! I’ve shared a few of my favorites at YBR, like my one pan Mexican Chicken and Rice. I don’t always love the calories though, so I’ve tried to lighten up those dishes wherever I can. 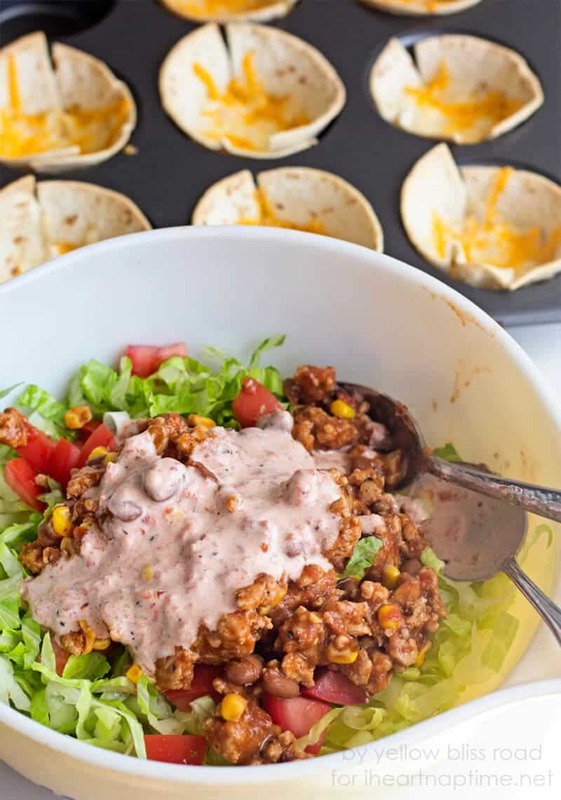 For example, in the taco salad recipe that I’m sharing at Yellow Bliss Road today, I use lean ground turkey in place of the ground beef. 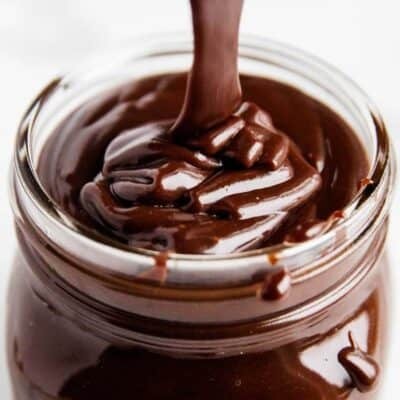 All of the flavor without all of the fat! (The key is to purchase the LEAN ground turkey – otherwise you can end up with just as much fat in the meat as the lean ground beef). 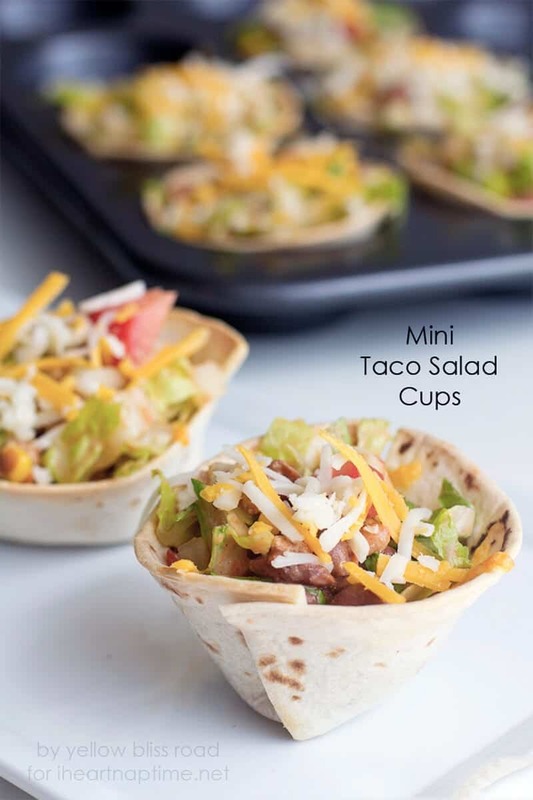 For today’s recipe, we are going to put together a delicious taco salad that’s tossed in a yummy ranch salsa and served in mini taco cups. (tip: cut out a few calories by using whole wheat tortillas). You will first bake up the tortilla cups. 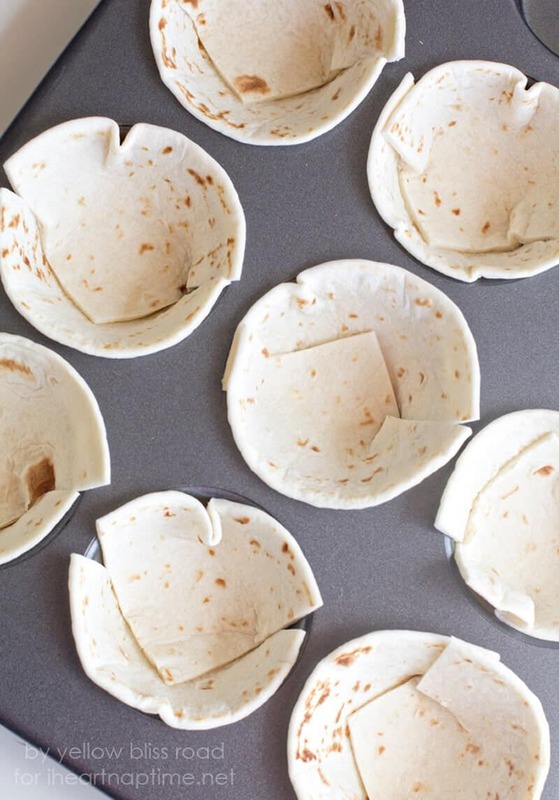 Cut a few flour tortillas into quarters and press them into grease muffin tins to form a cup. Sprinkle a little cheese into the bottom of each cup. (You can skip the cheese to cut a few more calories). Bake in a preheated 350 degree oven for about 8 minutes, remove from the oven and set aside. I love how that cheese gets all melty on the bottom. 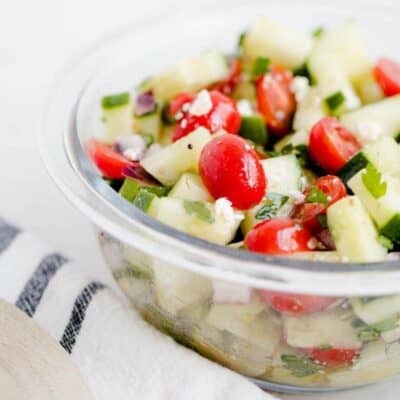 It reminds me of my favorite Cafe Rio salads – yum! Next you will assemble your taco salad. Layer shredded or chopped lettuce, then any toppings you prefer. 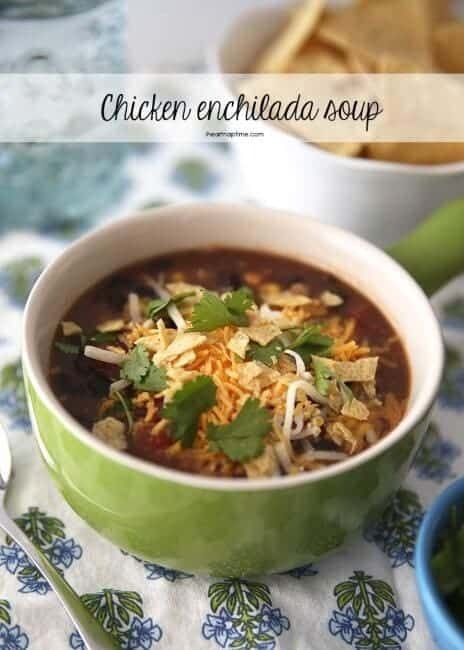 Some ideas are black beans, ground beef, diced tomatoes, shredded cheddar cheese, avocado, cilantro, corn, olives or green onions. Top with just a small amount of salsa ranch (made by mixing a little bottled ranch with some salsa). I use a 1 to 2 ratio of ranch to salsa, depending on the size of your salad. To make the 12 taco cups, I used about a tablespoon of ranch and 2 tablespoons of salsa. I’ve found that dressing is really a personal preference, some like a lot, and some like a little, so add as much as feels right to you. 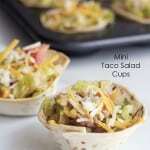 Toss that salad up until it’s evenly mixed, then spoon the mixture into the baked taco cups. Sprinkle with cheese, cilantro or green onions. These mini taco cups are amazing! So good! Your favorite salad toppings tomatoes, olives, green onions, etc. Brown ground turkey or beef in a nonstick skillet. Add chili beans, salsa and corn. Bring to a boil, then reduce heat, cover and simmer meat mixture for about ten minutes. Remove from heat. Cut tortillas into quarters, and press two quarters into the bottoms of greased a muffin pan. 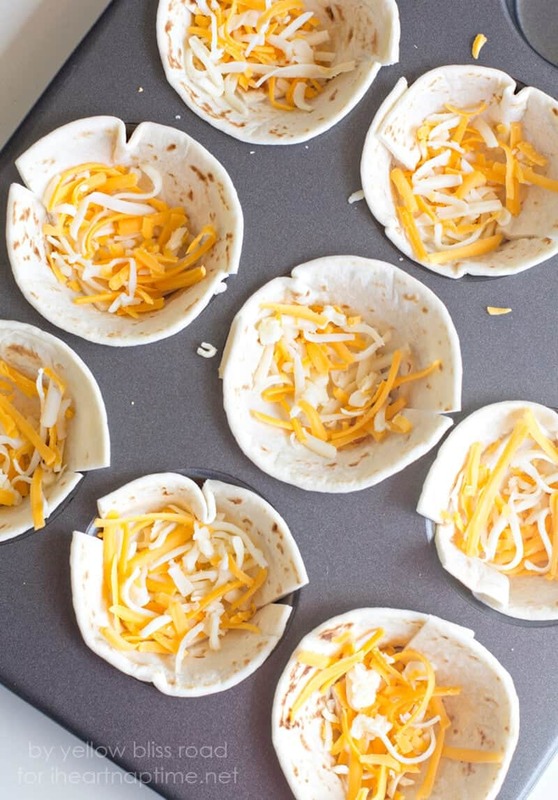 Place about 2 teaspoons of shredded cheese in the bottom of each cup. Bake in the preheated oven for about ten minutes, or until tops of the tortillas just begin to brown. (Watch carefully – you don’t want them to burn). Prepare your salad ingredients, including your meat topping, and layer it all in a large bowl. In a small bowl, mix 1 part Ranch dressing with 2 parts salsa – 1-2 tablespoons of ranch dressing with 2-4 tablespoons of salsa. Pour on the salad and toss. Spoon salad into tortilla cups and garnish with shredded cheese, if desired. 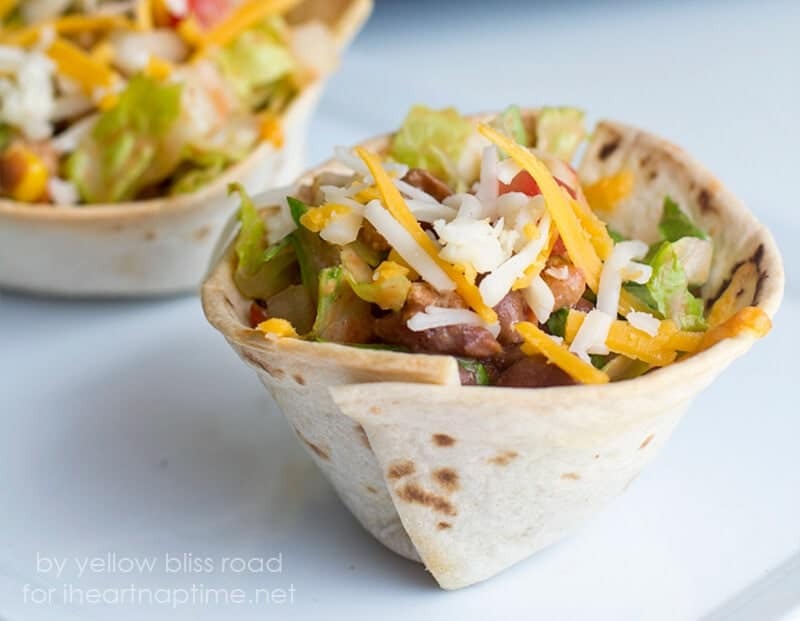 The baked tortilla cups stay together perfectly and are very easy to eat with your hands. The tops get nice and crispy and the bottoms stays soft. 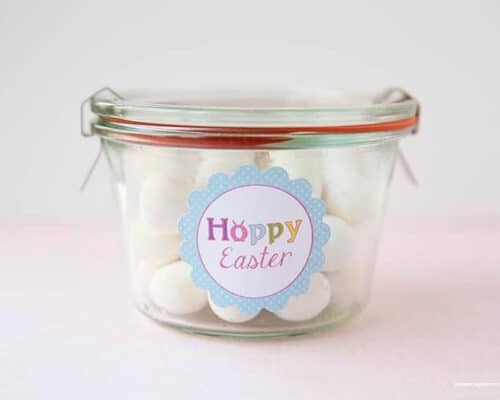 I got the idea for the cups from Ella Claire, who has created several delicious recipes with them as the base. What’s your favorite Mexican recipe? Holy macrel these look yummy! My kids would LOVE em! I agree, my kids would love how they are mini!